You can never get lost as long as you have your Android phone’s Maps app. That’s because it always knows where you are — even when you don’t. To find your current street address, or any street address, long-press a location on the Maps screen. Up pops a card, similar to the one shown. The card gives your approximate address. The time under the Travel icon (the car in the figure) indicates how far away the address is from your current location. If the address is too far away, you’ll see the Route icon. When you have way too much time on your hands, play with the Street View command. Choosing this option displays the location from a 360-degree perspective. In street view, you can browse a locale, pan and tilt, or zoom in on details to familiarize yourself with an area, for example, when you’re planning a burglary. 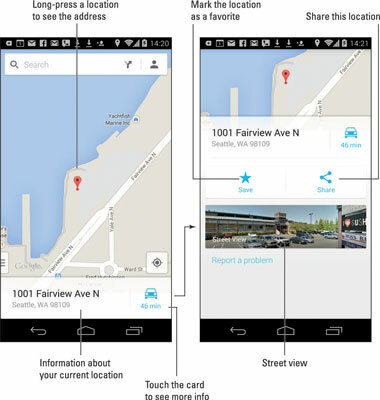 You can use your Android phone to send your current location to a friend. If your pal has a phone with smarts similar to those of your Android phone, he can use the coordinates to get directions to your location. Maybe he’ll even bring tacos! To see your current location, touch the Location icon in the lower-right corner of the Maps app screen. After long-pressing your location (or any location), you see a card displayed showing the approximate address. Choose the app to share the message, such as the text messaging app, Gmail, Email, or whichever useful app is listed. Continue using the selected app to choose a recipient and otherwise complete the process of sending your location to that person. As an example, you can send your location by using the phone’s text messaging app. The recipient can touch the link in the text message to open your location in his phone’s Maps app.